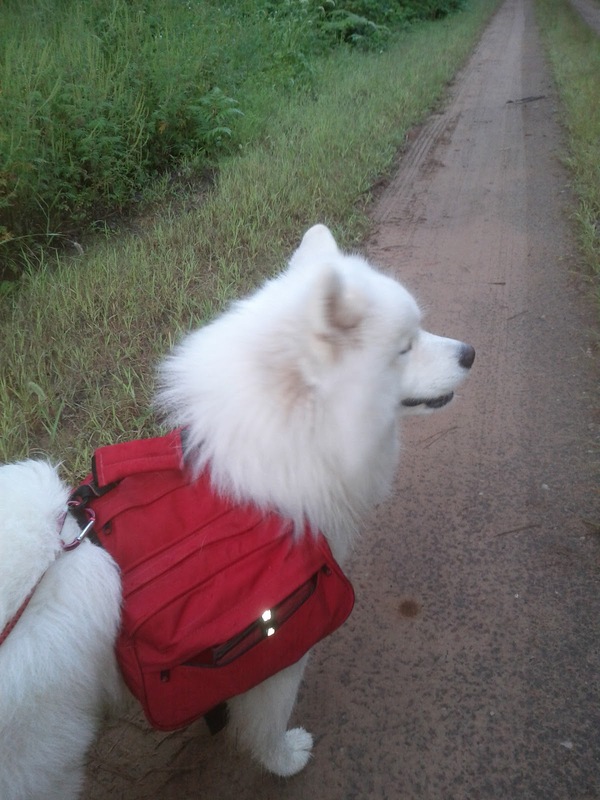 Photo 51 Samoyeds: Worst Pack Hike, Ever. Seriously. Worst Pack Hike, Ever. Seriously. 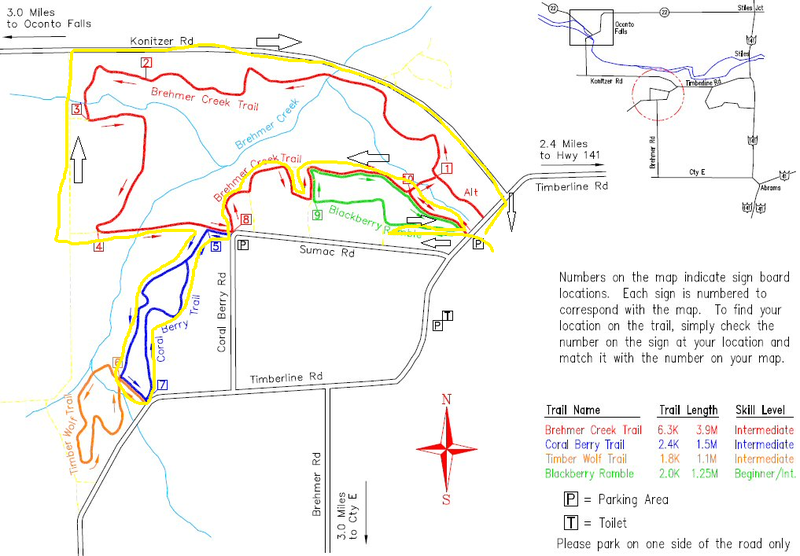 First, the marking of the trails was horrible. We walked for miles in some cases without being sure where exactly where we were and none of the "numbered posts" that the map we got on the website promised existed at all. Secondly, Mendel can't give his opinion but I personally feel that 25% of his weight is much more than I would ever normally require my dog to carry, even if we were camping. But, I wanted Mendel to have a well rounded WS title so we did it by the rules. And we survived. 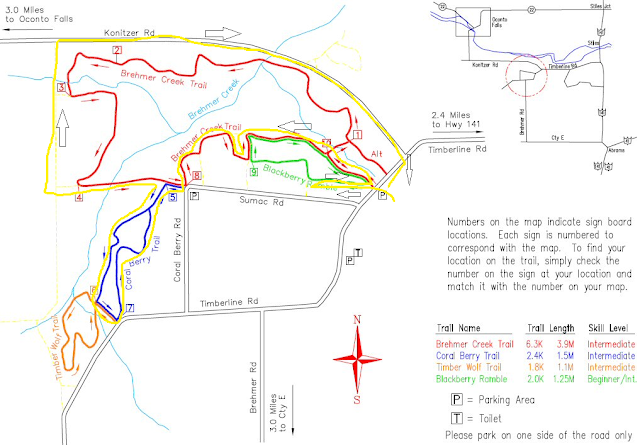 We started out thinking we were on Brehmer Creek Trail, but eventually I figured out we must be on the Blackberry Ramble trail. The blackberry bushes were positively terrible once we were on the trail for a bit. My legs got all scratched up (they're still itchy) and I worried about Lilly with no heavy coat to protect her. Good thing she was at least wearing a pack, even though all she was carrying was a leash on each side. I also worried about the dogs' eyes. We turned back and tried to figure out how we went wrong after about 1/2 a mile. I was super impressed with how consistently Mendel was pulling me along. This is a big improvement from the last time I had him on a hike. 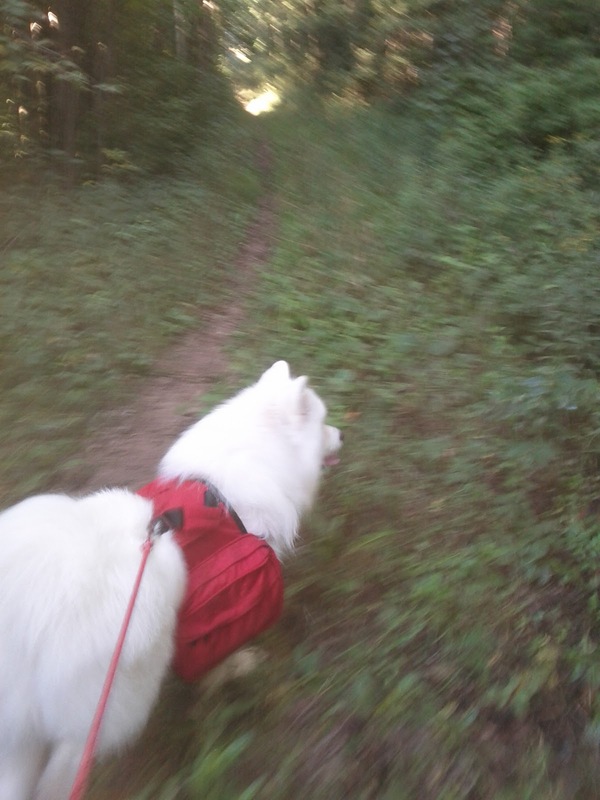 He's now pulling with nice steady pressure rather than starting and stopping and weaving all over the trail. Finally we got back on track and after a quick drink of water were headed down the Brehmer Creek Trail, well, at least we're pretty sure it was the Brehmer Creek Trail. It was narrow in spots, but for the most part was a pretty nice trail. We came upon a sign pointing to the Coral Berry Trail so after a rest stop we decided to give it a try. The one and only time Mendel and Lilly were naughty and tried to pull me off the trail was evidently a result of their noses getting the better of them. We found what appears to be a deer skeleton. 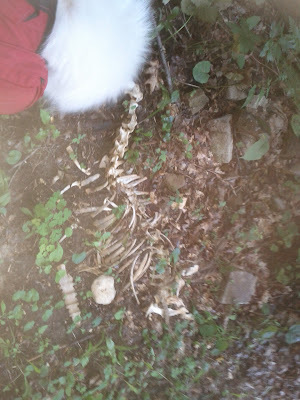 I had to convince them that there was no way they were taking any of the bones home. After the Coral Berry Trail we got back on the Brehmer Creek Trail... until it just suddenly ended. I'm not sure what in the world happened. 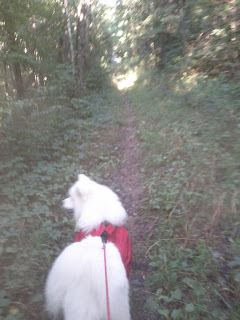 We hiked up a big slope, Mendel helping me along, and then the trail just dead ended. Maybe some plants suddenly shot up blocking the trail, I'm not sure, but we looked around and just couldn't figure out where in the world we were supposed to go. 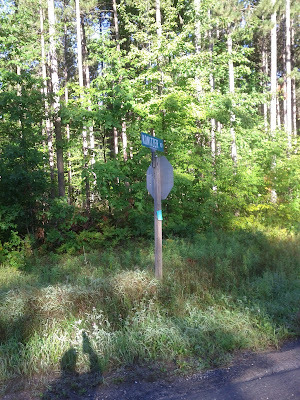 I really started to question whether or not we were even on the right trail anymore, we hadn't seen a sign in a long time and never once saw a number marker that our map claimed would be there. I thought I saw a sign of some kind through the trees a ways in front of us so we decided to fight our way through the woods and see if it would help us. We wound up on a dirt road. 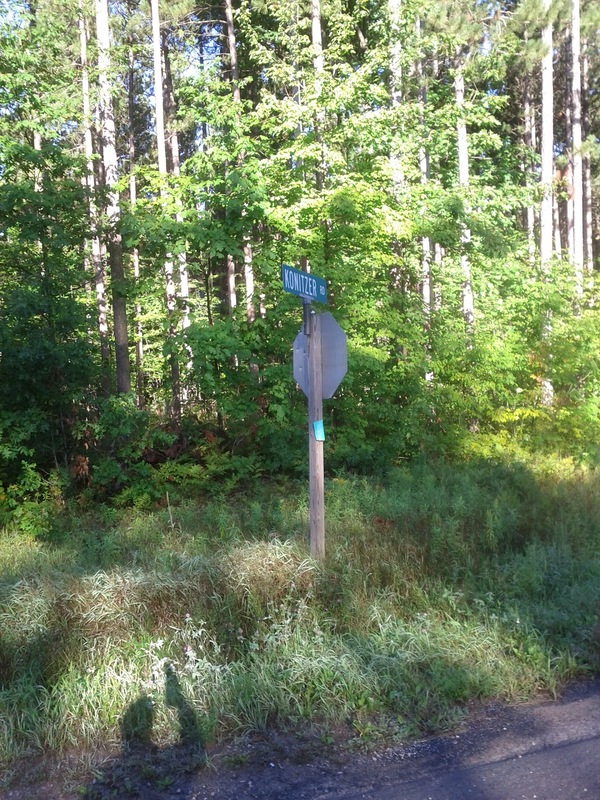 The sign had been from a lady named Beth who was looking for her lost horse saddle. Making our way down the dirt road. 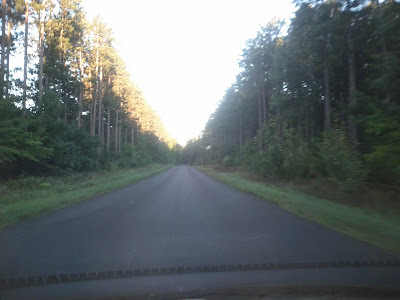 I figured we'd probably be better off lost on a dirt road than lost in the woods, so on down the road we went to see if we could figure things out. Then we came to a paved road. In looking at the map I was pretty sure it was Konitzer Rd, but I was extremely grateful to come upon a mailbox that had the full address posted on it so I knew for sure. 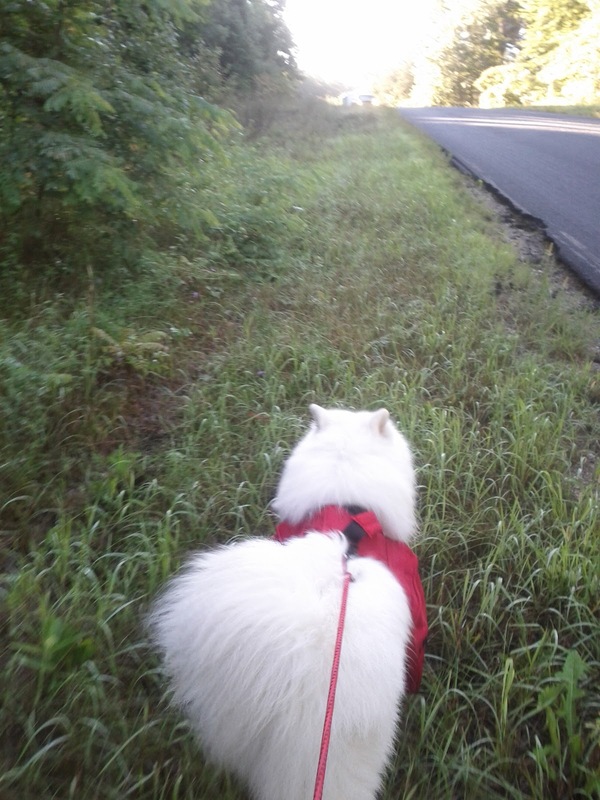 The road was only wide enough for two cars and had tons of hills and turns so I didn't want the dogs on the road. We walked in the soaking wet dew covered grass along the road for miles. Once we came to a fairly safe spot in the road we stopped for a rest and some watermelon (Mendel's favorite). FINALLY we came to an intersection. I was pretty sure this was Timberline Rd, but right in line with our luck, there was no street sign to confirm my suspicions. We decided to head down the road in the direction I thought the car would be and before long it appeared! I don't think I've ever been so happy to see my little car. 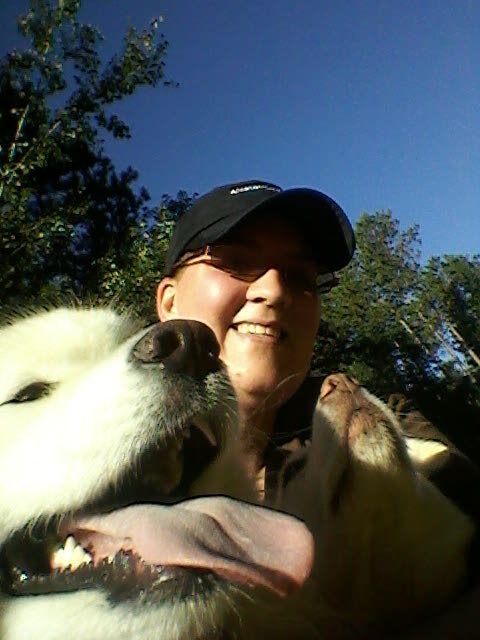 Before we got all packed up and loaded in the car, Mendel, Lilly and I attempted to take a picture together. No two dogs I'd rather be lost with. :) We started and ended at the same spot, where there was parking for the ski trails. The yellow line on the map (and the arrows) show our path.